This is all good advice, especially about practicing in open water. There are no pool ends to push off of every length in open water – it can be much more tiring. It can also be a little claustrophobic, since there will be little visibility in the water. Practice swimming with eyes closed while in water, and only opening them when you turn your head or lift your head. Visualizing the swim before you do it helps too. And after all of this, if you still have a panic attack, just do what I did once on a long swim when that panicked voice inside me wanted to DNF and climb into a rescue canoe – tell yourself that you didn’t train all those long months just to quit at the beginning of the race! I also thought of how disappointed my friends and family would be, and how inspired they would be if I finished. Just remember, the worst part of the swim is to the first buoy. Once you make it there, you WILL finish! Thanks for this! – This will hopefully help me start training again and be able to swim in open water with out having a panic attack! Thank you so much! Just the advice I needed heading into my first ever Sprint Tri. I had a severe fear of the water for most of my life. Triathlon was my motivation to deal with it. I tell people it’s not that I don’t still get afraid or panic during races, it’s that I have the skills to cope and move past the panic. Thank you for writing this!! My first Tri, I made sure to concentrate on swimming when training but neglected to do it in open water. Although I’d been swimming my whole life, as soon as I put my face into the water in that first race and realized I couldn’t see I got that claustrophobic panic. I ended up doing kind of a bastardized dog paddle that probably looked HILARIOUS but it got me around the buoy and onto the bike leg! I practiced in open water a bit for my second tri and managed to reduce my time in the water by nearly half but I still have a long, long way to go – and these tips are exactly what I needed. Thanks!! I have heard the swimming is the hardest part. Thank you for the valuable information. I have use of open water and plan on spending as much time in it as possible, especially with my wetsuit on! It is so true that the wetsuit feels restrictive when swimming if you never wore one before!!! Practice with the wetsuit in open water not once or twice until you are comfortable with it then you will be ready for the race. That was a very helpful article. After five sprint triathlons, I continue to experience mild panic attacks during the swim. I hyperventilate nearly the entire 1/4 mile distance which carries over onto the bike leg. I’ll have to try the “singing a song” technique! Thank you for the advice! Good tips. 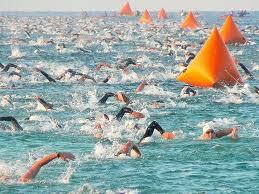 I always thought I was a great swimmer until I did my first Tri. I paniced 100 meters into the swim, and had to grab a kayak. I was not ready for the noise, splashing chaos, ect.. Regained my nerves, and finished the swim. I still am a little quesy before a competivie swim, but I relax my breathing during the swim and tell my self to make each stroke better than the one before it. Also, if you do have a slow swim, you can always hammer it on the bike make up the time!!! Thank you, thank you, thank you. This couldn’t of come at a better time. I just jumped into a dirty green HOT lake for my first open water practice and was so freaked out I almost cried. Now I know I’m not being a big baby, and if I keep at it, I actually might be okay for my first sprint. Key advice: If you’re not a good swimmer, don’t start in the front. I’m not the fastest runner, I’d never start in the front of a run, have the same respect for swimmers. I used to be nice and try to swim around people at the start, but if you were arrogant enough to put yourself there, I will go over you.